Too many yeast in the intestines (yeast overgrowth) is a common problem that occurs in those with chronic Lyme disease. This problem occurs during treatment, or prior to beginning treatment. Antibiotics used to treat Lyme can lead to too many yeast. Immune suppression prior to starting antibiotics can also cause yeast overgrowth. Yeast overgrowth can result in an ongoing systemic allergic reaction to the yeast that can suppress the immune system. Yeast overgrowth also leads to inflammatory cytokine excess that causes many of the Lyme disease symptoms and pain. Food allergies and sensitivities are the result of yeast overgrowth, too. 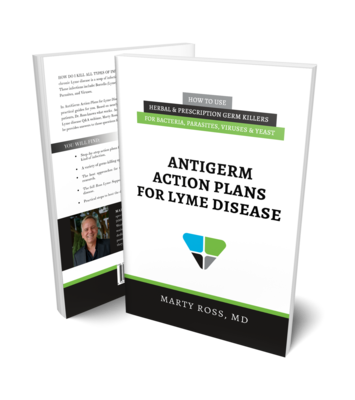 Learn more about cytokines in Control Cytokines: A Guide to Fix Lyme Symptoms & The Immune System. In this article, I lay out a number of natural and prescription medicine options to treat yeast. For information about diagnosing too many yeast, read A Silent Problem. Do You Have Yeast? The most common and effective prescription medicines used to treat yeast are from the azole family of antimicrobials. These include fluconazole (Diflucan), ketoconazole, and itraconazole (Sporanox). The other common prescription anti-yeast medication is nystatin, but is much weaker than the azoles. Also, take a high-quality probiotic which promotes healthy intestines. See the probiotic page at Marty Ross MD Supplements for high quality probiotics I recommend. Generally, two to four pills 1 time a day taken atleast two hours away from herbal or prescription antibiotics is helpful. nystatin or an herbal combination mixture. Alternatives to an azole-based treatment include an herbal combination mixture or a compounded prescription medicine called amphotericin B. Take an herbal combination mixture 2 pills 2 times a day. (Common herbs found individually or mixed together that promote yeast removal include: Pau D'arco, caprylic acid, rosemary oil, thyme oil, garlic, and grapefruit seed extract.) Also take a probiotic as I discussed above. This herbal approach will work but may take three months. For bad yeast infections, you may even need to stop your prescription antibiotics while trying this approach. Amphotericin B is only manufactured in an IV formulation. However, for intestinal yeast infections, a compounding pharmacist must mix it for oral use. Otherwise, it is barely absorbed into the blood stream and thus has no systemic toxicities. I am pointing this out because in an IV form, it is terribly toxic to the organs of the body but it is completely safe in oral form. Take Amphotericin B as a 200 mg pill 3 times a day for two months. You will need a prescription for this medication sent to a compounding pharmacy. For a really severe yeast infection you may even need to stop your prescription antibiotics. Also, take the probiotics I discussed above. Unfortunately, yeast is becoming resistant to fluconazole. When this happens, there are four other options. With each of these options be sure to include the probiotic mentioned above. One option is to try the amphotericin B 200 mg 3 times a day for 2 months. My local compounding pharmacy in Seattle charges $250/month for this. A second option is to use itraconazole 100 mg 2 pills 1 time a day for 30 days combined with either the nystatin or an herbal combination mixture discussed above. Without insurance coverage, this costs around $500/month. A third option is terbinafine 250 mg (Lamisil). This medicine is approved for the treatment of fungus infections. It is in an entirely different family than the azoles. In a generic form, it costs around $50 for a one-month treatment. Take terbinafine 250 mg 1 pill daily for 2 full months. An experimental option to support yeast elimination is lufenuron. This is a veterinary medicine that may block the production of chitin found in the coverings of yeast. Chitin is a hard-fibrous substance found in insects and yeast. It is not found in humans. Take 3 gm for 3 days in a row. I find that four rounds of treatment are needed. Repeat doses are taken every 11 days after the first dose for 3 more days. Be aware that this is an experimental treatment. Human studies have not been done, but it does appear safe in animal studies. See Lufenuron. An Experimental Yeast Treatment for more information about this medicine and where to purchase it. Often, in yeast resistance I also advised my patients to stop other herbal and prescription antibiotics. Because of costs, I usually used terbinafine first, then amphotericin B, and finally itraconazole. I saved lufenuron as a last resort. In yeast resistance, based on my clinical experience, Amphotericin B taken for two months works 95 percent of the time, itraconazole taken for 30 days works 80 percent of the time, terbinafine taken for two months works 80 percent of the time, and lufenuron taken for two months works 80 percent of the time. While treating yeast, it is essential to limit simple sugars and juices. Simple sugars are those items which have a lot of sugar added like coke, candy, cookies, cake, and ice cream. Limit simple sugars to starve yeast. For those with a great deal of resistance, a paleo diet can help. Read more about the paleo diet in The Best Brain, Inflammation, Pain, Energy, and Detox Diet Ever. Bellmann R, Smuszkiewicz P. Pharmacokinetics of antifungal drugs: practical implications for optimized treatment of patients. Infection. 2017;45(6):737–779. doi:10.1007/s15010-017-1042-z. Ching MS, Raymond K, Bury RW, Mashford ML, Morgan DJ. Absorption of orally administered amphotericin B lozenges. Br J Clin Pharmacol. 1983;16:106–108. Kumamoto CA, Inflammation and gastrointestinal Candida colonization. Curr Opin Microbiol. 2011 August;14(4):386-391. doi:10.1016/j.mib.2011.07.015. 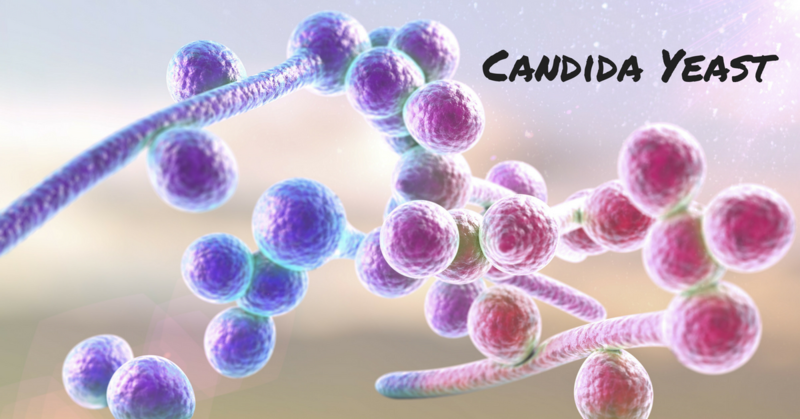 Olmstead S, Meiss D, Ralston J. Candida, fungal-type dysbiosis, and chronic disease: exploring the nature of the yeast connection. Townsend Letter. http://townsendletter.com/June2012/candida0612.html. Accessed September 16, 2018. Ross M. Lufenuron: an experimental yeast treatment. Treat Lyme. https://www.treatlyme.net/guide/lufenuron-an-experimental-yeast-treatment. Accessed August 15, 2018.